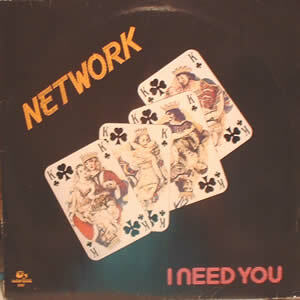 The legendary Network album which has been highly sought after mainly in Europe with the 80s boogie funk collectors. The story behind this album seems to be that it was due for release on Salsoul Records but for some reason it never did although a few hundred copies did escape via the Rams Horn label in Holland. 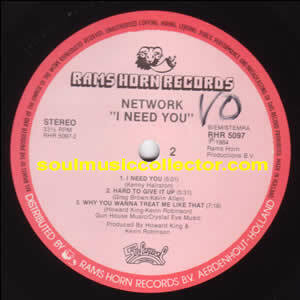 Although released on Rams Horn this was not an official release and most of the copies were called back with only a few hundred at most left in circulation. An impressive line up of muscians played on the album such as Howard King (drums) , Raymond Jackson (bass) , Kevin Robinson (guitars), Scott Yarney (keys) , Johnny Kemp (vocals) , Kevin Allen (vocals) and Kenny Washington (vocals). There are many stand out cuts all of which are laden with keys and bass accompanied by great vocals from the various vocalists. If you like the 80s funk sound of D Train and Mtume then this album is for you.